Download free Qlik Sense extensions that will allow you to conveniently reload data directly from your app. Do you work with Qlik Sense? We will make life easier for you. Extensions are intended for all Qlik Sense users who want to work with the most up-to-date data. Extensions enable convenient reloading of data directly from front-end applications. Thanks to the EMARK Reload Task Button, it is no longer necessary to open and know the Qlik Management Console just to start reloading, not even in the case of a published application. Another related extension is the EMARK Reload Task Status, which informs you about the status of the applicationreloading. 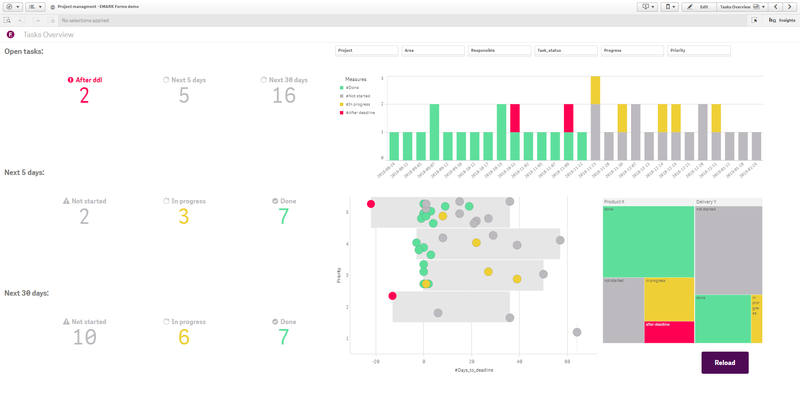 In addition, it allows you to add more settings and broaden the capabilities of Qlik Sense even further. Download free Qlik Sense extensions and reload data directly from your app. Thanks to our unique, automated, reboot-based access without the need to open QMC, no additional settings to provide the user with the published application script or otherwise change environmental security settings as is the case with other available solutionsare required. At first glance it may seem just like a normal button. However, we've decided to shift its capabilities beyond the reload of a particular app due to the different settings available in this extension. For example, the EMARK Reload Task Button is not explicitly linked to the application in which it is used - with the right settings, it can run reload in any other Qlik Sense application. Together with the EMARK Reload Task Button extension, we have developed another separate full-featured EMARK Reload Task Status extension that informs users of the current reload status of the application (successfully completed, running, ended with error). Additionally, the object updates itself automatically, so no refresh of the page or browser is required. We decided to add some special feature to EMARK Reload Task Status. Now it can belinked to the task of any app in Qlik Sense. Thanks to its minimalistic design, it can provide users with very important information on a small area. Adding this extension to an app lets you and others know if data is up to date or the application is reloading in the background. If it is necessary to inform the user in more detail (and not only about the status of the reload), it is possible to switch to the text view. With the expansions that we have incorporated into these objects, you can create a custom application that will let users know about reloads of the most important applications across the environment - all in the Qlik Sense Hub environment. EMARK Reload Task Button that can run individual apps will surely be appreciated by all administrators who have a QMC link stored only to run and check reloads. Are you interested in details about EMARK Reload Task Button and EMARK Reload Task Status? Let us know. We will be glad to speak with you. I hereby give my consent to processing of my personal data for business and marketing purposes. Personal data processing is regulated by national law of the country where the personal data are processed. By selecting the field “I agree with the processing of my personal data and sending of business offers and marketing information”, I hereby agree to the processing of my personal data pursuant to Act no. 18/2018 on the Protection of Personal Data as amended, and Regulation (EU) 2016/679, the European Union’s new General Data Protection Regulation (GDPR), by EMARK Group (EMARK s.r.o., Company ID: 35 803 606, with registered office at Dúbravská cesta 14, 841 04 Bratislava, Slovak republic; EMARK s.r.o., with registered office at Husinecká 903/10, 130 00 Prague 3, Czechia; Company ID: 28861281.; EMARK Services s.r.o., with registered office at Štefánikova 639, Zelené Předměstí (Pardubice I), 530 02 Pardubice, Czechia; Company ID: 06441921; EMARK QS with registered office at A. Rudnaya 21, 010 72 Žilina, Slovakia; Business ID: 36744972; EMARK Systems, with registered office at A. Rudnaya 21 010 72 Žilina, Slovakia; Business ID: 44389744.) I hereby agree that my personal data will be processed and stored for marketing purposes (sending invitations to professional events, occasional newsletter, online marketing or phone calls) or occasional business offers (regarding products and services) via e-mail, online tools, text messages, or occasional phone calls. In rare cases some of the data could be transferred to group EMARK MR (Determined by agreement between EMARK and competent partner within contracting geography/territory.) Further info contact us here: info@emarkanalytics.com) and Qlik Group (QlikTech Netherlands B.V., QlikTech Inc.) in accordace with EU-U.S. Privacy Shield and Swiss-U.S. Privacy Shield Frameworks (solely for business case registration). For further information click HERE. You can find detailed information about how we process your personal information on this LINK. Agreeing with the processing of personal data and sending business offers and marketing information is voluntary and can be revoked at any time HERE.